I have to admit, at first it was my previous Epicurean Cyclist and randofile leanings that attracted me to the Velo-Orange Grand Cru cranks. They are definitely easy on the eye with the fluted cranks, 50.4 bolt circle and the way the wide range double creates a nice concentric ring pattern. Modern Shimano cranks, in my opinion, are ugly and look more like some Alien/stingray/circular saw mashup that look out of place on steel bikes. I’ve had the Grand Cru cranks installed on my bike for the last few months and I have to say that they are more than just a pretty face. They come with 46-30 rings installed which make for a very practical range for both commuting and loaded touring. Why more modern cranksets don’t come with such a useful double combination is beyond me. Typical road doubles (53-39) and even compact cranks (50-34) I feel are geared too tall and mountain doubles (39-26) too low, leaving a big empty hole of useful double combinations in the middle. 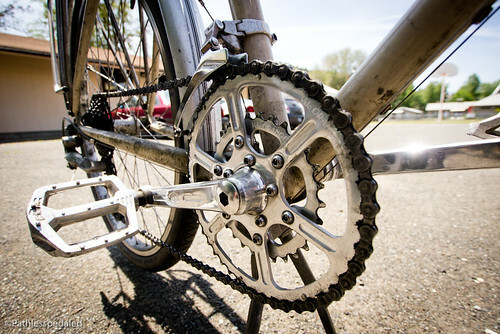 A 46-30 when paired with something like the 12-36 cassette gives an enormous range of very usable gears with lows in the mid-20 gear inches and highs in the mid-90 gear inches. The first reaction most will have is “wow that’s a huge tooth jump” between the 46 and 30. Yes it is. But in actual use because the 46 is such a reasonable chainring size there is very little front shifting. I find that I am in the 46t ring for about 98% of my riding and only drop into the 30 when fully loaded on long sustained climbs. When I DO drop into the 30, I know well in advance that it is going to happen because of the steepness of the grade so it doesn’t come as a jarring surprise. I do admit, I had a rough beginning with the Grand Cru cranks, but through no fault of its own. I left my bike and crankset at a local shop to have it installed. 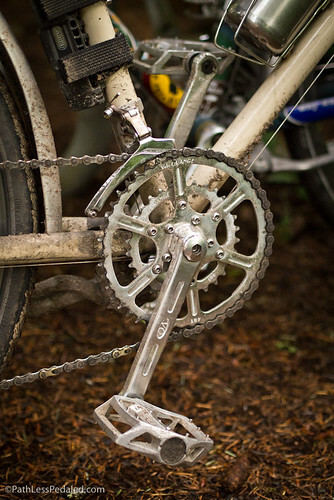 I was running an XT triple before so they had to replace the front derailleur with a narrow cage double so the body of the derailleur wouldn’t hit the crank when it was in the big ring. A few weeks later, I went on my first overnight tour and I noticed the chainring looked awfully wobbly. Upon further inspection (ie shaking the crank arm), I noticed that the driveside crank arm had worked its way loose. I had to borrow an 8mm allen head to torque it back down, but at that point the damage had been done. On the ride back from the tour it had loosened itself again and I had to stop at an REI to really torque it down. 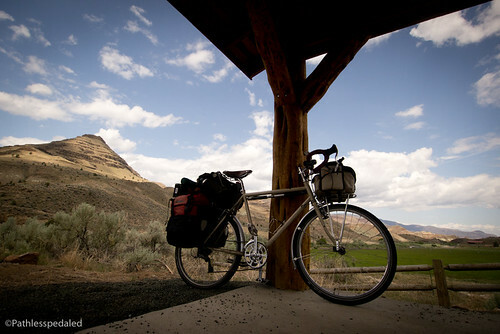 Unfortunately, we were scheduled to go to Eastern Oregon very soon after for a bike tour and I didn’t have time to replace the cranks. I brought my bike into VeloCult to have them work some magic. We surmised it was a bad install by the previous shop because there were a few other things that weren’t working quite right (front DR not properly adjusted, chain length too short, etc.,). They applied some Loc-tite to the arms and cranked them down. They needed to get me through a 175 mile loop in the middle of nowhere. 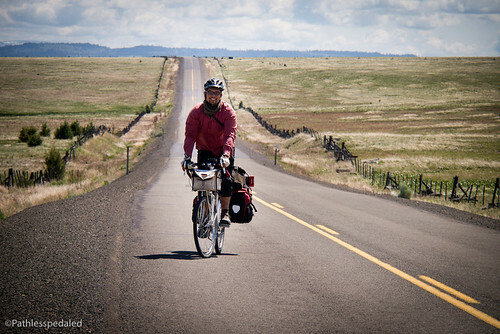 The Eastern Oregon trip would be the first real fully-loaded test for the cranks. There were some good sustained climbs on the route and we were carrying full camping gear. My theory that a wide range double would be enough for a fully loaded tour was going to be put to the test. I didn’t have the psychological comfort of a 24t bailout gear to fall back on. Thankfully, the cranks performed as expected (and didn’t fall off to boot!). I was in the 46t for about 95% of the time, but did drop to the 30t during a long day which included a 1000ft climb after hours into a headwind. I feel that 46-30 with 12-36 is a great combination for fully loaded touring if you tour with reasonable loads. We’ve learned to pare down quite a bit since our early touring days and a triple back then was necessary. However, as our packing and gear has become more streamlined so has our drive trains. There is some chatter on the interwebs about the cranks and rings being flexy. I’d like to give a definitive answer on that, but I can’t. Too many variables with the initial bad install were introduced for me to really tell. Also, I don’t have any experience with anything but square taper cranksets, so I wouldn’t be able to comment their relative stiffness to all the newfangled bottom bracket technologies out there anyway. Suffice it to say, that for me everything worked out fine. I initially wanted these cranks based on looks and on the notion that a wide-range double might make sense for touring. After having used them on several overnighters and one longer multi-day fully loaded trip, I’m sold on the real world practicality of wide-range doubles. For hillier and off-road routes I might opt for a 44-28t combination or even a mountain double (39-26). The Grand Cru cranks are great looking and also perform really well (just make sure they are installed correctly). The stock combo is just about perfect for commuting, overnighters and loaded touring with reasonable loads. You’re not going to break any speed records on the flats with the 46 but if you don’t race and don’t want to be bothered with constant front shifting these cranks are for you. My first exposure to a double was on my salsa vaya. I liked the idea, but not the fact that you can’t lower a compact more than 34 tooth. Never happy with the vaya, but sold on doubles. I built up a rawland with the vo polyvalent crankset and I’m sold on a 46/30. I just wish there were other options than vo as they’re out of stock whenever I decide to order the 50.4 bcd ones. I’m out a crankset till their container comes in. For a smaller inner ring, check out harris cyclery. Just want to echo your excellent review. My crankset progression was racing double, to triple, to this one. I’m very happy. I thought the big ring size difference would make shifting a bit harsh, but it has been as smooth as anything I’ve ever experienced. Papabybike: There are a couple of other possibilities for a wide-range double, though they’re more expensive than the VO crank. Compass Cycles sells a René Herse-branded 70mm BCD double, with chainrings from 24t to 50t. Peter White carries the Spécialités TA Carmina crankset, with an interchangeable spider; the 94mm BCD double will take a small ring as small as 30t and a large as big as 50t. I think for another option, surly’s Mr. Whirly can be set up with a similar range too. Most of the other options aren’t off the shelf solutions so you have to know what you want. And the cost often ends up a bit high compared to a basic compact double or triple. All that being said, I much prefer this setup and like having a low range as opposed to a 1x setup or a triple. Another option is to scour EBAY for 94/58 bcd crankset, the so called compact mountain cranksets popular in the 80-90’s. Ritchey did one and Raceface, Specialized etc. They will take a 29T ring in the middle position. Russ, thanks so much for this post. I’ve been getting ready to build up a Handsome Devil as my do-most-everything bike – from some (most likely light) touring, to long day road rides with friends to commuting. Although I live in a not super hilly area now, I used to live in the PNW and thought that for touring sake alone I would definitely need a triple. But, this has me thinking maybe not? Why have you switched back from your Bromptons to a full size bike? What bottom bracket length did you use? You can do 42/26 using the middle and inner rings of a 110/74 triple. Combine it with an 11/34 cassette and you have 103 to 20 gear inches. It takes the compact philosophy and extends it to lower gearing. I’ve used this “super-compacy” set up for years. It’s been a long while since I’ve responded to any of your writings. I started watching your progression into cycling back in 2009 when you were in the LBC. Glad to see you two are still going strong! Thanks for this review. I have a VO triple in a box waiting for a VO BB and a few other items before I do a major drivetrain refresh. I’ve had some concerns about going to a triple, plus it requires replacing more of the drivetrain than I’d like. I think I will send the triple back and get this double. The plan will be to match this with a Shimano XT 9 speed rear derailleur with a SRAM Apex 10 cassette and Ultegra brifter. I am doing a 6 day tour this summer from Crescent City to SF. The plan is to go light. Camping each night but no cooking. Last time I toured this section we ended up cooking only a few times. It wasn’t worth carrying the extra gear everyday. Thanks for this review. I read this review when you wrote it which is almost two years ago now. How about a quick update? Are you still using this crank set up? Any issues that have popped up over time? I keep planning on putting a wide range double on my bike, but never seem to get around to it. Thanks. I sold the bike with the cranks a few months ago just to cull the fleet a little. The cranks were still working great. No problem. If there is any complaint, I prefer a slightly smaller large chainring. I’m running the Sugino Compact cranks with 44/30 and really dig that combo. Combined with a 12-36, I rarely have to shift out of the “big” ring except for steep climbs. Thanks. Have been thinking about this crankset but just don’t trust the internal bb’s to last. I am thinking of buying a shimano road triple and one of their CX outer rings. Placing it in the middle position to get this range. I have compact setup and I find I am in the middle to lower half of my cassette most of the time. Figure the 46 would expand my use of the smaller spockets in the cassette and the 30 would give me slightly more low end. Running 11-28 7 speed right now but could see at 11-34 paired with that combo as the best range for the buck. Thanks. Nice review. Will this work with a 11 speed SRAM set up? Will the 46-30 play nice with Sram Doubletaps?